HealthSeeker mobile is the app version of our award-winning HealthSeeker Facebook game. While you can still play the game through Facebook, this app makes the experience more, well, mobile. You don’t have to wait to log on to Facebook to complete your missions, you can do it from anywhere you have your mobile phone. How convenient is that? It seamlessly integrates into your life and makes doing healthy actions more immediately gratifying. One of our new app features will also include a way to take and share photos of your accomplishments. 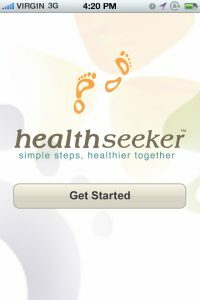 HealthSeeker mobile app will be available for both iPhone and Android. The game HealthSeeker is a unique collaboration between experts, advocates and industry partners who are on the front lines of healthcare. It was developed by Ayogo for the Diabetes Hands Foundation in collaboration with Joslin Diabetes Center, with support provided by Boehringer Ingelheim Pharmaceuticals, Inc.
Healthseeker, our award-winning Facebook game, was designed with the goal of helping adults living with diabetes or those at the risk of developing diabetes with specific lifestyle and nutritional challenges. The game creates compulsion loops around reciprocal social obligation, gifting, collection, and achievement to motivate action and engagement in a healthier life. The idea of shifting a player’s concerns from big commitments over long periods of time for greatly deferred rewards to small manageable actions in short periods of time for instant rewards, has been very popular with players and medical professionals. At Pixel and Pills, shot at ePatient Connect in Philadelphia, Michael explains some of the reasons why Healthseeker is such an engaging game and talks about some of the game mechanics. Adam Penenberg for Fast Company has interviewed Michael about Healthseeker and how video games modify behaviour. And MIT’s Technology Review featured Michael and Healthseeker in an article about social games that sway behaviour. In November of last year, a Spanish version of HealthSeeker became available to 10 million Latino and Hispanic users on Facebook. For more great press about HealthSeeker, please visit our Press Page.